Here’s another fun gadget for the festive season to go with your Star Wars Nutcracker Set, the Star Trek Nutcrackers. These fun Star Trek Nutcrackers stand 12 inches tall, and two versions are available, Capatain Kirk and Dr Spock. Forget red-coated nutcrackers” everybody knows that the color of their tops doom them from the start. This holiday season, decorate with a prosperous long life in mind. 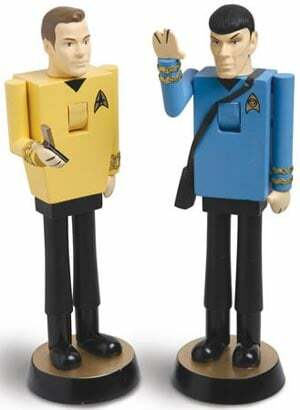 Choose from classic Spock or Kirk character nutcrackers, each wonderfully crafted from wood. These fun nutcrackers are available to buy online for $34.95 each from What on earth.